It was only a few weeks ago that I was sharing with you my hair care routine including my super old straightener, which you could almost say is from the stone age. 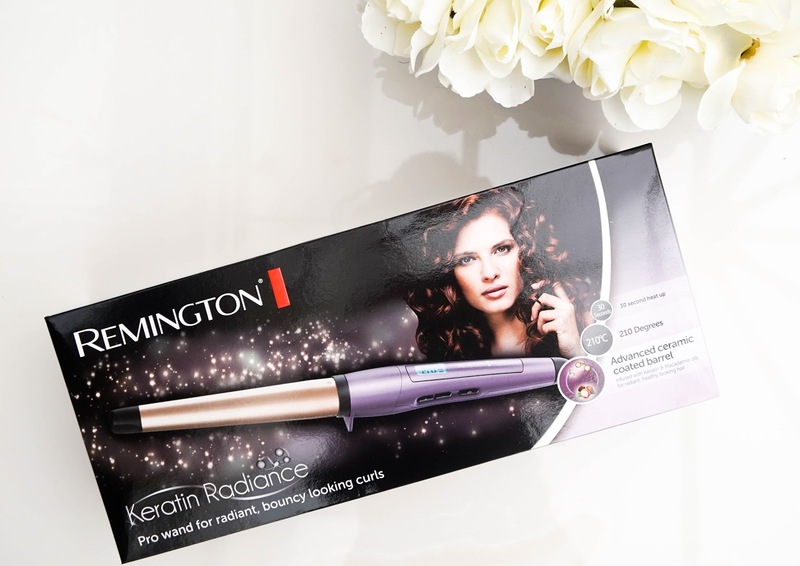 So of course when Remington got in touch for a collaboration, I was excited to update my hair tools and try out the new Keratin Radiance range for upcoming AW16. The range consists of ground-breaking styling tools that harnesses the very latest in hair care technology. 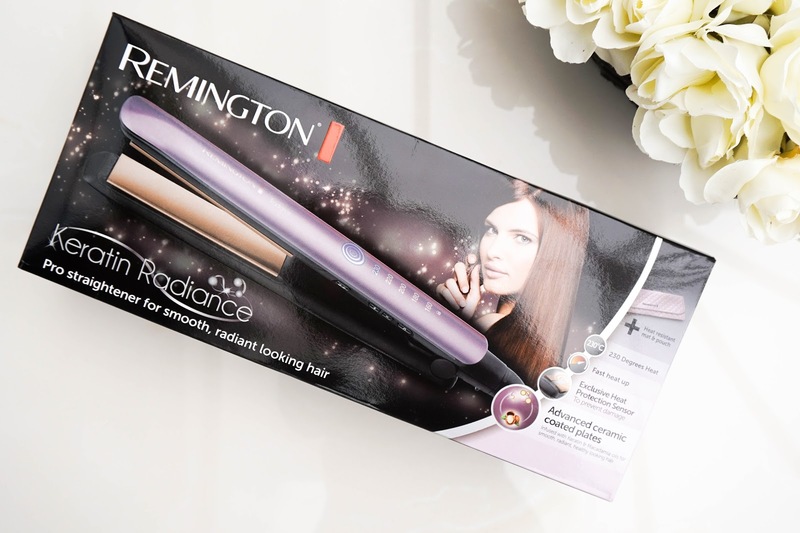 Remington have cleverly combined Advanced Ceramic coatings with Protective Technology, which is kinder to your hair without compromising on the styles desired. 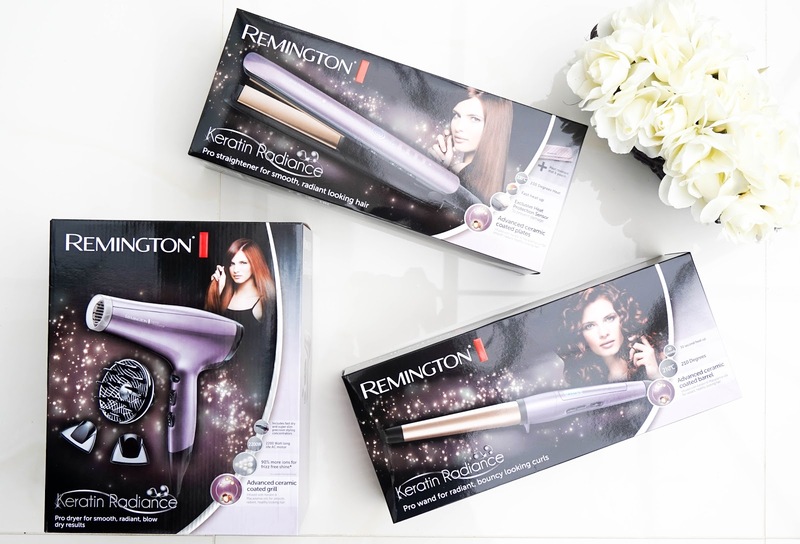 I was sent three products from the Remington Keratin Radiance collection - a hair dryer, a straightener and a curling wand, that aim to deliver superior care without compromise. So basically now I can be sure that my hair remains protected, regardless of my choice of style (because I'm useless when it comes to using hair protectants before styling) . One thing that impressed me as soon as I opened my package was how well the products have been created, so they're not only effective but look stylish too. I also loved that Remington's AW16 campaign focuses on the everyday hair/beauty troubles along with the feelings that women have towards their own appearance. With this new range the brand are on a mission to help women turn their hair ‘woes’ into hair 'woahs' (and I'm all about that since styling my hair has always been a difficult task for me). 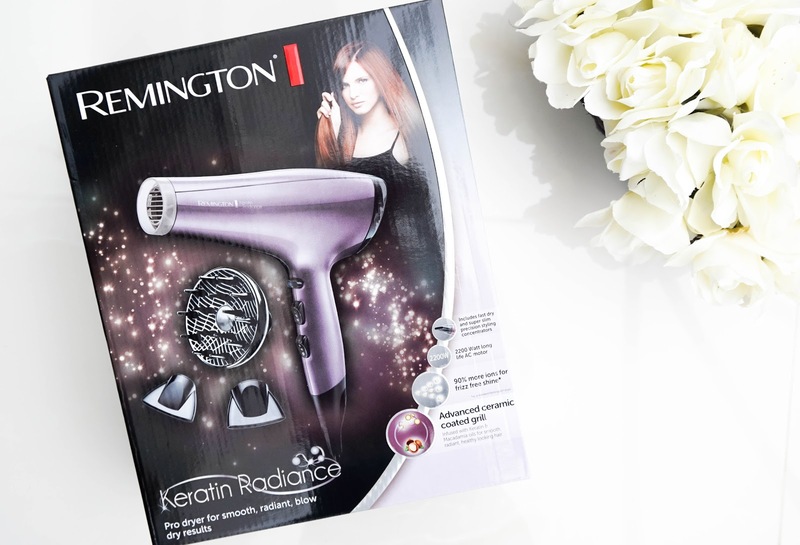 So first up I've got the gorgeous Keratin & Macadamia Radiance Dryer*, which you can use to dry & style for smooth, radiant, healthy looking hair. This hair dryer not only looks stylish with a beautiful finish, but it also feels super lightweight. Despite that is actually has 2200 watts of power, so that means your hair will be styled much faster, making the whole process a breeze. The technology behind this dryer is that the Advanced Keratin & Macadamia Ceramic coated grille transfers micro conditioners onto the hair as you dry it, for a shiny & healthy looking finish. I've used the dryer a couple of times since receiving it and I was impressed overall with how my hair felt & looked after a a quick blow dry. I don't dry my hair often as it tends to get frizzy and will stay that way for a couple of hours, but with this new dryer I had different results, which left my hair looking bouncy & glossy (not easily achieved when you've just bleached your hair). I love that the dryer has 3 different heat settings and 2 speed variations also. 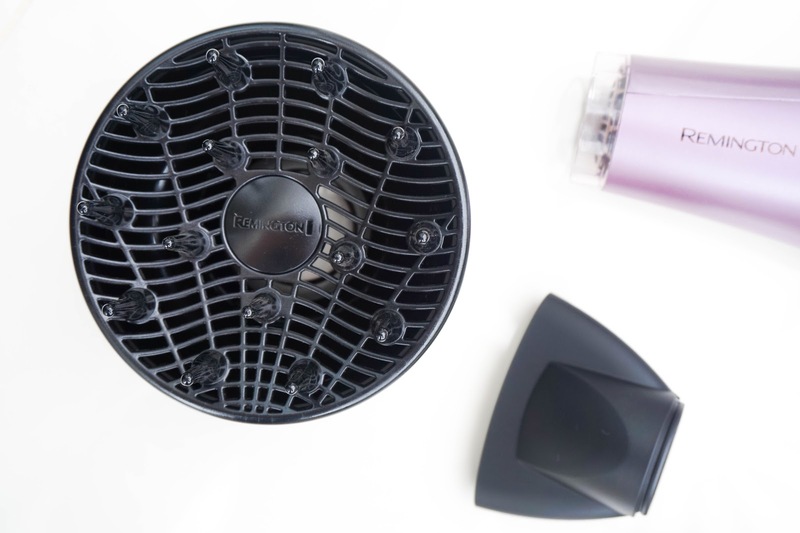 Another great feature is the true cold shot button which should be used at the end of your blow dry, since it helps to cool down the hair follicles for a shiny finish and a long lasting style. In the box you're also included a choice of two concentrators and a diffuser attachment (I have only used one of these options - the 11mm fast drying concentrator because I am yet to check out instructions on how to style my hair with the diffuser). Next up I've got the Keratin & Macadamia Radiance 19 - 28mm Wand*, which is definitely quite new to my hair care routine but I'm eager to experiment with it more. I'd love to be able to create those Pinterest worthy waves to my new shorter hair do, so practice is key with this new hair tool. Once again the barrel has been coated with Advanced Keratin & Macadamia Ceramic and infused with Micro Conditioners, which transfer to the hair as you style. As the name suggests the barrel is 19 - 28mm, which is perfect for creating loose curls for my current hair style (I'd imagine if your hair is longer than naturally the curls will be tighter). 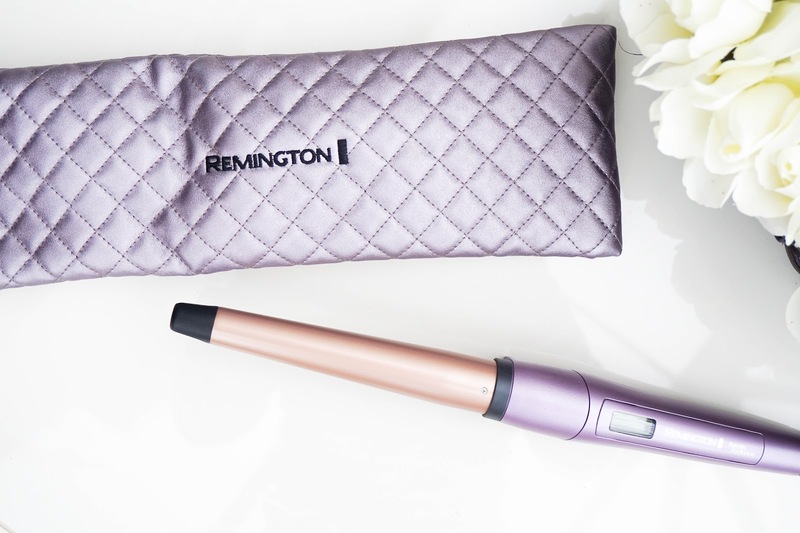 I also love that this curling wand is designed with 5 different heat settings ranging from 120°C - 210°C, so again it ca be personalised to your own hair needs. 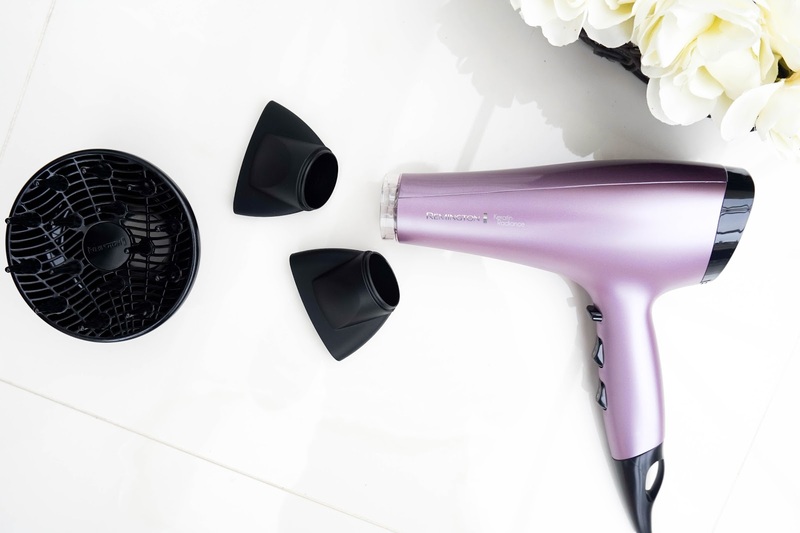 Another great feature is just how fast this heats up, it literally only needs 30 seconds before you can start styling your hair. 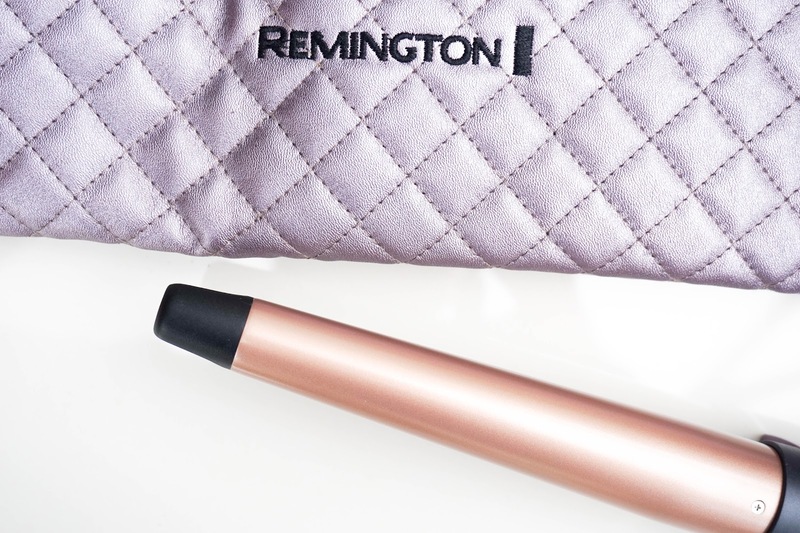 A great safety feature with this curling wand is that it shuts down after 60 minutes of being in use, so there's no need to worry throughout the day if you've left the curler on (does that just happen to me?!). Within the box you've also got included a heat resistant pouch, which looks luxurious and stores away the curler perfectly. 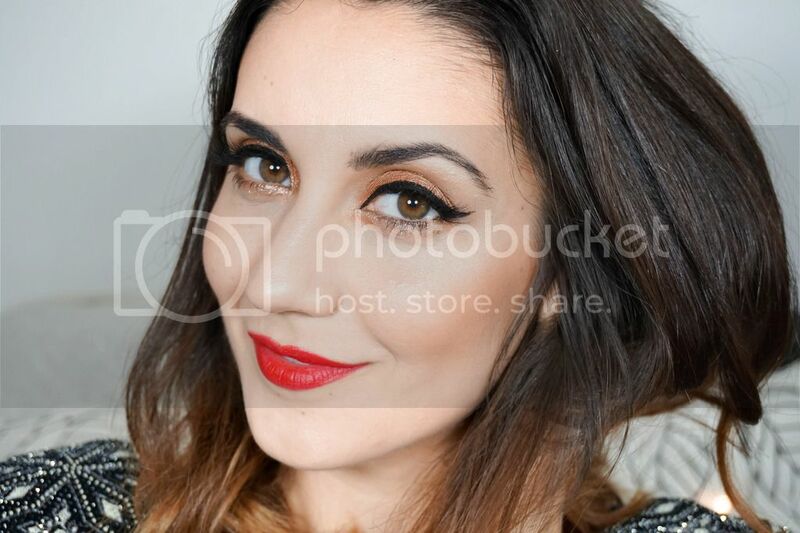 I've done a bit of research regarding on how to get the best natural waves and one tip to remember as a beginner is to curl away from the face. Another tip that I had my doubts about at the beginning is that you need to brush your hair through once it's been styled, for a natural finish... just thought I would share if anyone else is as clueless as me. Lastly I've got my favourite of the bunch, the Keratin & Macadamia Radiance Straightener* simply because it's a hair tool that has been in my routine for a while now, so I knew how to use it immediately. 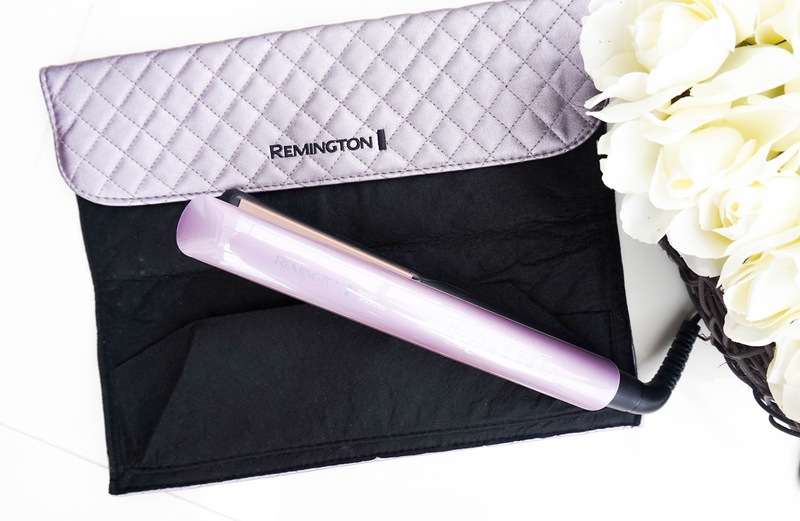 The straightener has been designed to protect hair and offer guilt-free styling, which gets a huge thumbs up in my book as I'm always worried I will damage my hair further when using heat. The Advanced Ceramic Coated Plates with Macadamia oils have been proven to strengthen and protect the hair with a glossy finish overall. Keratin Micro Conditioners are infused in the plates, which are then released upon heating and transferred to the hair whilst styling. I noticed a difference with this straightener instantly, as it left my hair looking super shiny and the results lasted all day. The only problem was that my hair felt greasier sooner than expected... I have a problem with my roots looking oily within a day of washing it and this seems to intensify the issue. Considering this is an issue I'm quite used to, hence why dry shampoo is a firm favourite in my hair care routine - I didn't bother me too much, but I thought it was worth noting. The 110mm plates offers heat the option of 5 different heat settings, so you can opt for a low temperature of 160°C or go as high as 230°C. The best part is that it will heat up almost instantly within 15 seconds, so there's no waiting around needed. You've also got the option of choosing the innovative & exclusive Heat Protection Sensor, which has been embedded in the top plate to detect the moisture levels of your hair and optimise the temperature in order to prevent damage. Again you've got a safety automatic shut down setting available, as well as a luxurious heat resistant storage pouch included. If you've made it this far, then thank you so much for reading... I can't appreciate it enough as I know it was a lengthy post, but I just wanted to make sure I was given you all the details needed if you decide to splurge on a hair tool from the range because I know it will be an investment. 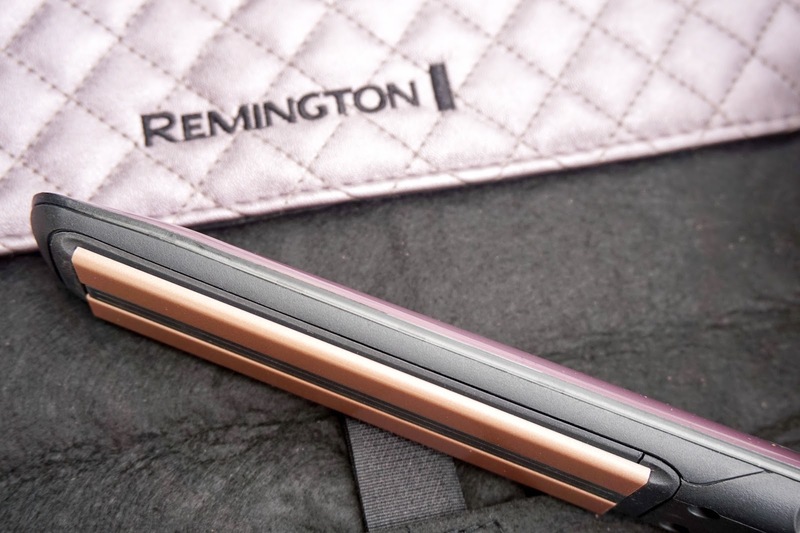 What is your favourite type of hair tool and have you used Remington as a brand before?! Let me know your thoughts in the comments below!